This shooting drill sniffer is a fun, competitive shooting soccer drill, enjoyed by youth soccer teams up to college level soccer. - Shooting drill sniffer is set up grid 40 by 30 yards, but vary dependant on age. Players from defending half should be able to shoot from their area, but not easily. - Have all the balls either in the goals, or with you at half line. - Have a 4 v 2 in favor of the defenders in each grid, vary to 3 v 2 if need be. - Either 1 goalie begins with ball or you, and players have to score to earn point. - No player may cross the middle line. 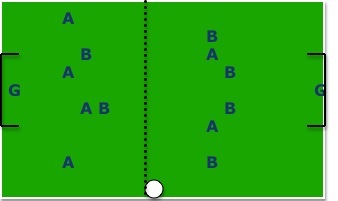 - Players are allowed to pass the ball across the center line. - Ideally this is to get lots of quality shots on target. Great for all players, goalies, defenders, and attackers to work on fundamentals. - Drill should be performed at game speed with high intensity and urgency. - Shots from anywhere should be encouraged, not having to get close to goal to shoot. - Attackers should be trying to show for the ball, and follow up shots. - Defenders should look for shots, close down attackers quickly, and get to rebounds while looking for a quick transition from defense to attack. - Remember, encourage lots of shots, and successes! - Add a 5 yard wide channel to each side of the drill, and put 1 player in each channel. Players MUST pass the ball wide at least once prior to scoring. Upon the ball going wide, 1 player from the defending half may enter the attacking ONLY for the cross. Players in outer channel have only 1 touch max to cross the ball. - Add option for any successful pass into the attacking half, 1 defender may enter the attacking grid only until a shot is made, or a turnover then must return to defending half. - Force a player to retrieve their ball if they miss the net, thereby urging accurate well placed shots. - 12-20 minutes for this shooting sniffer drill.